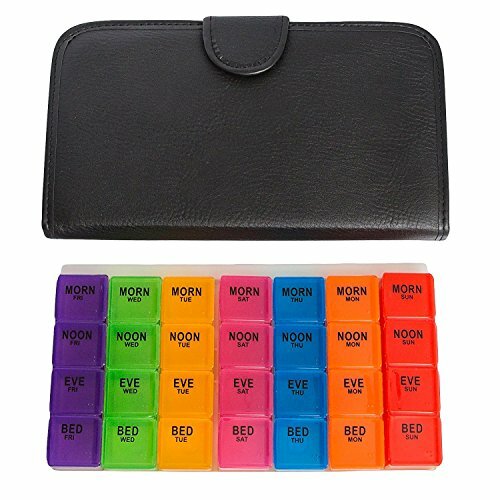 These Pill Organizers are great! Its nice to be able to move the days the way I want. (I organize my pills on Monday for the rest of the week. I grab the set I need for the day, put it in my purse, and at the end of the day, I move the empty to the back, and am set to grab the first set the next morning. This will be so much easier for travelling, too. Having the box to keep them nicely packed together, and sealed, will be so much easier for setting out in my hotel room. And color coded/recognizable. Each day of the week has a different vivid color, Take the day's box out of the to carry the pills for the morning or afternoon with you. Double Secure Locking lids will prevent any spill issues. Helps in easy remembering of daily medications - useful travelling companion, work, school, and outdoor sport.